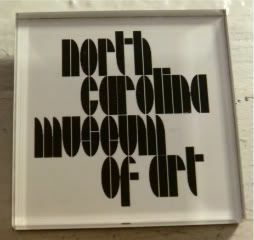 joy magnetism: NCMA - Go. Now. Keeping this entry short and sweet - if you're ever in Raleigh, definitely check out the NC Museum of Art. Small, but nice collection, and a great venue to wander around. Love it. This magnet's the second magnet from their gift shop, the first was a gorgeous Rodin one. Picked it because the entire family decamped to Durham today, in prep for heartpatientdad's procedure tomorrow. I'm not sure if Durham's big enough for the entire family, but we'll see who's left standing after this week.